Sweet Treats by Sarah: Bad Cake Pictures - NOT Bad Cakes! Bad Cake Pictures - NOT Bad Cakes! These poor cakes deserved so much better and you deserve better photos to look at! The time has come for me to invest in some nice backdrops and a better lighting solution for late night photos. I must do better, I WILL do BETTER! If you can get past the shadows, reflections and off colors, I've posted a little info on the materials I used to make the decorations. 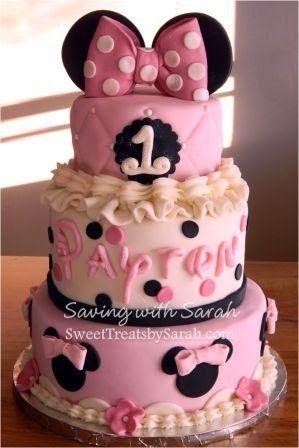 This 3 tier pink Minnie Mouse cake is covered in marshmallow fondant. The ears and bows are made from a MMF and gumpaste mix to hold their shape. Ears are held on with skewers and the top bow has a straw inserted down through the middle of each bow to keep it steady on top of cake. What you can't see in this photo: There are sparkles and shimmer on the letters, numbers and bows. There are also small polka dots on the bottom bows. 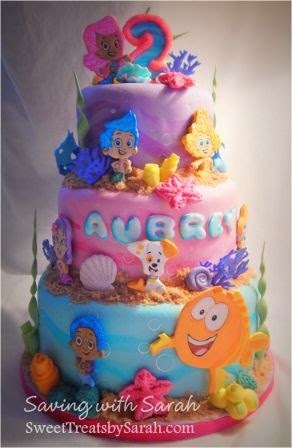 The girly 3 tier Bubble Guppies cake includes all the main characters. It is also covered in marshmallow fondant. 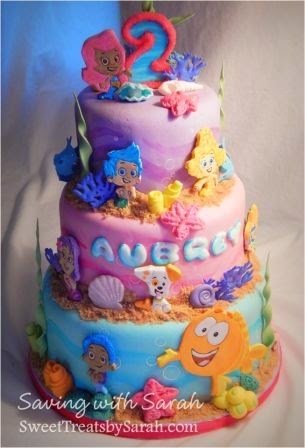 I painted the "waves" onto the covered tiers and added white bubbles using the bottom of an icing tip dipped in food coloring. The letters are painted royal icing transfers. Each character was hand cut and painted gumpaste. The rest of the decorations were made from gumpaste, fondant, mmf and royal icing. 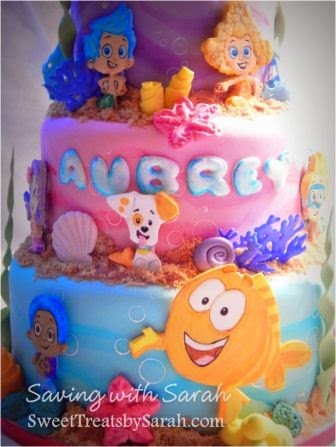 Sparkles and shimmer were added to the girl guppies, the cake topper and several of the sea decorations. Brown sugar was used as sand between each layer.